Miso Crafty Knits: I Fell...And Bounced Back Up With Yarn! I Fell...And Bounced Back Up With Yarn! It's been a while, hasn't it? The summer is just zooming along and it sure helps that there has been something planned every weekend since school has let out. We went glampin' camping up-island and spent a few glorious afternoons at the beautiful Rathtrevor Beach. The Munchkin and I headed over to the mainland, where he got to spend two and a half days basking in the attention of his uncles (and playing ALLLL the video games to his heart's content), while I got to sneak away and join the festivities for a friend's monumental birthday. I got the chance to sneak away to the mainland again a week later with a friend to attend the Hello Kitty Supercute Friendship Festival (yes, there really is such a thing and I honestly did go). During that last visit to Vancouver I got to make an unexpected yarn store stop and purchase some highly covetable self-striping yumminess. What's that? I bought yarn? I was doing SO well with that whole "I'm not buying yarn" thing too. Well, in my defense these were only the second and third yarn purchases this year. Not bad, right? Compared to previous years, I'm actually doing pretty darn awesome. I just have a slight weakness for all things self-striping. But then again, who doesn't? It all started when earlier this summer Knit Picks announced that were bringing back the beloved Felici in eight new colourways for a limited time. Um... Eight?? New?? Limited?? I'm so there!! I was good though, and had only purchased three of the eight new colourways: Teacup, Wizard, and Gummy Bear. A part of me regrets not adding a few balls of Mosaic to my cart too. Oh well. I'll live. I had allowed myself to get two balls of each colourway (meaning three pairs of socks - if I ever get around to knitting them up), so that's plenty of knitting right there. I just hope that Knit Picks doesn't bring out more new colours any time soon. Not that it would matter, the exchange rate right now is horrific if you're a Canadian knitter. I balked when I saw how much more I had to pay when I saw my credit card statement. The weak Canadian dollar really plays a huge role in why I haven't been buying much yarn. And maybe the lack of space. But we won't talk about that. I got these bad boys at Baaad Anna's in Vancouver. I feel so incredibly lucky that they had any skeins left in stock, let alone the main one that I've had my eye on. I had discovered White Birch Fiber Arts about a year ago on Instagram, when I saw that a fellow knitter had whipped up a pair of socks in the Nothing Says Screw You Like a Rainbow (I know, such a fantastic name!). I've been coveting the yarns ever since and every once in a while I like to go to the Etsy shop, salivate at every colourway, fill my cart, chicken out, and quickly close my browser in a sheer panic. Then in June I found out that Baaad Anna's was going to start carrying WBFA. I thought I was hallucinating. But it was true. 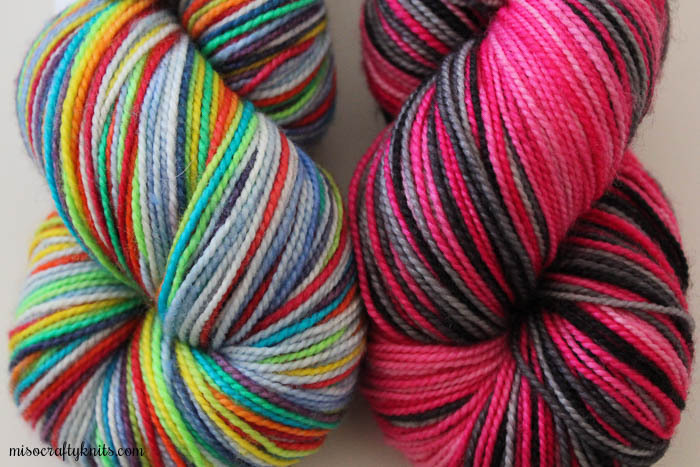 So when my friend, Arika, pointed out that the yarn shop was only a few blocks away from where we were for the Hello Kitty Supercute Friendship Festival, I got all giddy at the possibility that I could very soon own my own skein (or, in this case, two) of WBFA. I went into the shop with every intention of just getting the one skein, the aforementioned Nothing Says Screw You Like a Rainbow. But then I saw the hot pink, black, and grey skein. Well, if you've been reading this blog for any length of time you'd know that is my all-time most favourite of the favourites colour combination. Ever. Then I saw the name for that colourway and I was done: Hello Demon Kitty. I didn't stand a chance. This skein had too much going for it for me to just leave it in the shop. I mean, after just spending the entire afternoon at a Hello Kitty festival and I come across this??? It would have been stupid to not get it. Amiright?!? I'm really tempted to wind up one of these awesome skeins and cast on a pair of socks immediately, but that will have to wait. I still have a ton of baby gifts I would like to knit up and there's a secret project still on my needles (ooooohhhh!! Did someone say secret project?? Yeah, don't get too excited. It's just a special knit that I would like to gift to a special friend). Fingers crossed that by the time summer is over maybe, just maybe I'll be able to get back to the selfish knitting? For now, I'll leave a few of these skeins on my bedside table as "inspiration". Who knows, maybe some of those baby knits will come flying off the needles faster than expected and one of these bad boys will be allowed to finally grow up to be the pair of socks it always wanted to be? gorgeous new yarn additions!! 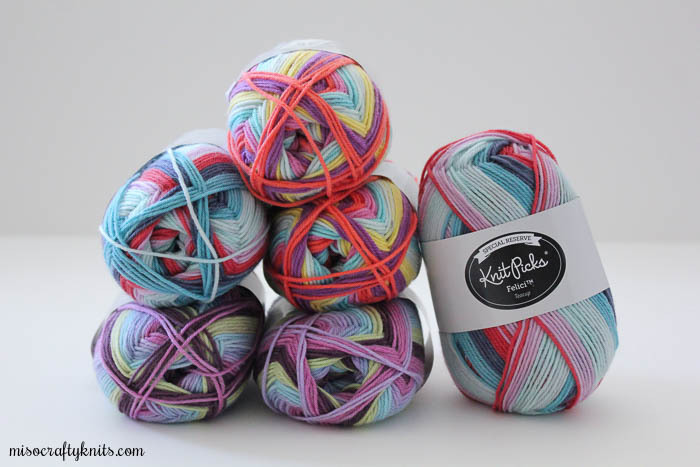 I too saw the amazing new colours for Felici, which is easily one of the best striping sock yarns, but the weak Canadian dollar had me thinking twice, too. the exchange is so brutal these days, sigh. I love your colourway choices! Thanks Julie! :) I have to admit, lately, with the exchange at where it is, makes me glad I have the stash that I do! Ooooh!! I've been carting WBFA, too! I'll have to make a visit to Baad Anna's! I hope they'll have some left! Thanks for the tip! I'm glad I can be of help in helping others enhance their stashes! 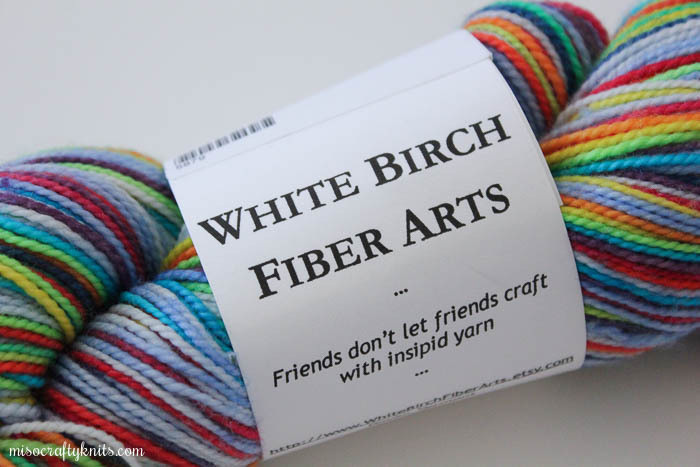 ;) If you go to Baaad Anna's and they don't have the colourways that you've been eyeing for WBFA, I found out that they'll have more in stock when Knit City rolls around. Yes, that's 3 months away, but you'll get the colours that you want? I bought Sparkle Pony and Molten! So much fun! Thanks for the heads up!